Even after the fall of the Han Dynasty, the Sogdians still controlled Silk Road trade between West Asia and China. By the 300s AD the Sogdians seem to have been the main traders not only between China and West Asia, but also between China and India. Samudragupta, the Guptan king, may have forced the Sogdians to pay taxes to India. Sogdian trade stopped for a while about 425 AD when the White Huns conquered the Sogdians, but by 557 AD the Sogdians were once again independent and went right back to trading. In the 600s AD, the Chinese Buddhist pilgrim Xuanzang went to Sogdiana and described the Sogdians as great traders. After the Arabs conquered the Sassanian Empire in the late 600s AD the Sogdians gradually became more and more Persian and started to speak Persian instead of Sogdian (but the two languages are pretty closely related). But the Sogdians kept on trading between the Islamic Empire and China. Some Sogdians even worked for the government of China. About 750 AD, An Lushan was a Sogdian who became an important general in T’ang Dynasty China. In 755 AD, An Lushan led a rebellion against the T’ang Emperor Hsuan Tsung. An Lushan made Hsuan Tsung retire, and made Hsuan Tsung’s son emperor of China. The T’ang Emperor Suzong, Hsuan Tsung’s son, hired the Uighurs as mercenaries to put down An Lushan’s rebellion. In 757 An Lushan was killed, and from then on the Uighurs were China’s main mercenaries. Suzong didn’t hire any more Sogdians! The Sogdians had to look elsewhere for support. 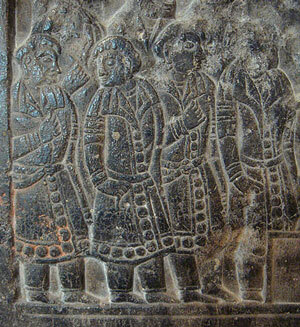 Although the Sogdians were still traders, they gradually got more and more involved with the Abbasid Empire. The Abbasid caliphs helped the Sogdians to fight off Tibetan attacks from the east. Slowly many Sogdians converted to Islam. By 819 AD the descendants of the Sogdians became known as the Samanid Empire. Cite this page: Carr, K.E. Sogdians in China – History of Central Asia. Quatr.us Study Guides, May 31, 2017. Web. April 21, 2019.